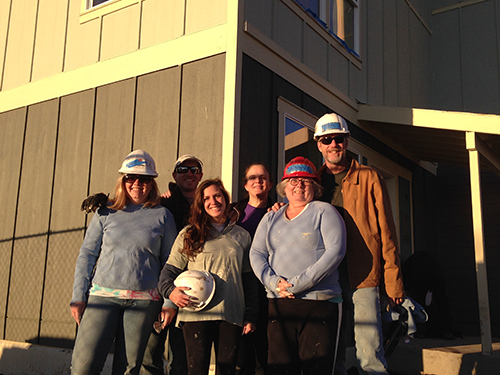 In the spirit of giving back to the community, a group of NEHA staff volunteered at a Habitat for Humanity build day! Habitat for Humanity is a non-governmental, nonprofit organization that builds affordable housing for hardworking families. If you’re not familiar with the organization, you can learn more here: http://www.habitat.org/. We spent the Saturday before Thanksgiving with about 30 other volunteers, working on the interior and exterior of row homes, which will house five families by the beginning of December. It was a fantastic opportunity to work with colleagues outside of our typical work setting, and meet others with similar community assistance based goals. Having a home, whether it is a condo, townhome or single family dwelling is an important part of life. And making sure that home isn't making you or your family sick is even more important. In 1999, The U.S. Department of Housing and Urban Development (HUD) launched its Healthy Homes Initiative, a program in which children and families are protected from housing-related environmental health hazards, such as mold, lead, allergens, carbon monoxide, pesticides and radon. These hazards affect the air quality of homes and can ultimately lead to chronic illnesses such as asthma and damage of the central nervous system. Environmental health professionals have historically worked to eliminate these hazards, some of which were once widely accepted (i.e. lead in paint), and today continue to monitor and mitigate these hazards through a variety of interventions and educational efforts. We continue to monitor hazard levels in homes to reduce harm and protect public health, and ensure that the homes being built today are held to a standard that will ensure the highest quality of health for its residents. This year, NEHA and HUD Healthy Homes are teaming up to host the Annual Education Conference (AEC), which will take place in San Antonio, Texas from June 13-16. The Conference provides environmental health professionals an opportunity to connect and continue their professional education in fields ranging from climate change to emergency preparedness among many, many others. The field of environmental health continues to grow and evolve and the AEC provides opportunities to build a professional network and learn about the latest developments. You can find more information here: http://www.neha.org/aec.